A new report released by the World Bank Group’s Lighting Global Program, Dalberg Advisors and GOGLA finds that the global off-grid solar industry has taken a leap in the past year to help developing countries reach their energy access goals. Dalberg estimates that, to date, the off-grid solar sector has provided improved electricity to as many as 360 million people. The 2018 Off-Grid Solar Market Trends Report, funded by the World Bank’s Energy Sector Management Assistance Program (ESMAP), is the biennial flagship publication for the global off-grid solar industry. It was formally launched during the 2018 Global Off-Grid Solar Forum and Expo in Hong Kong. As an in-depth study of the industry, the report set the tone for the convening by highlighting key industry investment trends, advances in technology, finance, policy and social impacts during the opening plenary to the 600+ industry stakeholders in attendance. One of the key findings of the report is the dynamic growth of solar devices over the past decade: an estimated 130 million off-grid solar products have been sold globally since 2010, ranging from small portable lanterns to 100+ Watt solar home systems capable of powering appliances such as TVs and fans. Selling in over 100 countries, these devices often provide critical first-time access to lighting and other energy services to the 2.2 billion people who still lack grid connection or reliable electricity. As the market has grown, so has the supplier base: a little over 60 dedicated suppliers in 2010 has grown to over 330 today, with increasing specialization along the value chain. In 2016, the most recent year for which complete data is available, total sales amounted to over 30 million devices, generating an estimated USD 1 billion in revenue. Sales growth of smaller devices are stabilizing, while larger devices have witnessed explosive growth of over 85% annually since 2014. This has been driven largely by pay-as-you-go (PAYGO) sales. PAYGO financing is bringing solar products within reach of more consumers than ever, and has the potential to revolutionize consumer financing in emerging markets across a much wider spectrum of products. “The numbers in the report reflect a dynamic young industry that is altering the economic landscape of developing countries while delivering unprecedented development impact,” explains Russell Sturm, Global Head of Energy Access at the International Finance Corporation. “However, the real story of the sector lies in the transformative power of innovation as revolutionary new business models and disruptive technologies continue to emerge across the market. This report provides a compelling view under the hood of that dynamic machine and casts a light on what may lie around the corner”. Investment in the sector doubled annually from 2012-2016, with companies raising approximately USD 922 million in financing between 2012 and 2017. Ten market leaders have moved ahead of the pack, attracting over 90% of all financing in 2016. Funding has also become more commercial in nature: the majority of financing since 2014 has been through equity deals, with a rapidly rising share of debt. While fundamentals remain strong, profitability has eluded the vast majority of players. Moving forward, an injection of capital will no longer be a substitute for a long-term, sound business model. Governments, too, are increasingly supportive of the off-grid solar market: they are incorporating off-grid solar solutions into their national electrification plans and developing regulation to support the private sector and protect consumers. Fast-moving performance and cost improvements in solar PV, battery, and appliance technologies also amplify the sector’s potential. Together, these and other trends explored in the report are expected to boost annual off-grid solar sales to 70 million units and USD 8 billion in revenues in 2022. Koen Peters, Director of GOGLA adds, “This report paints a picture of an industry that has firmly claimed its place in the energy landscape. It will continue to innovate quickly and is only becoming better at serving energy needs for customers in developing countries”. 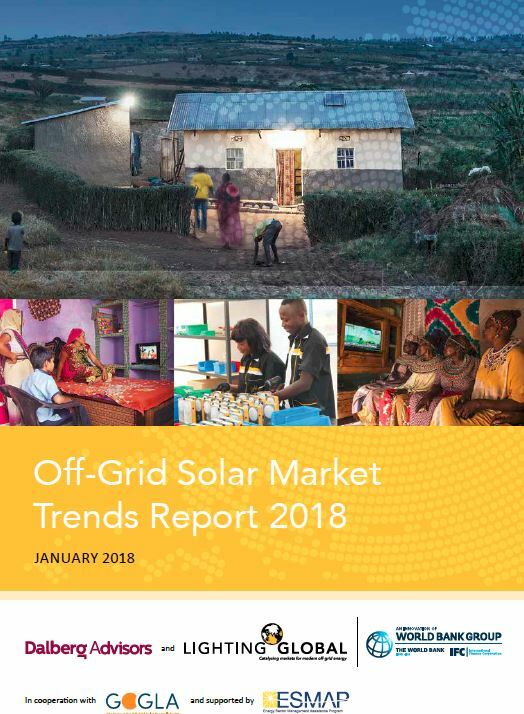 The 2018 Off-Grid Solar Market Trends Report is the fourth report in a biennial series established over the past 8 years as the report of record for the off-grid solar industry. While the Lighting Global/GOGLA franchise of six-month market updates serve as the go-to source of information for investors, industry members, policy-makers, and other stakeholders in the off-grid solar space, the flagship Market Trends Report provides an opportunity to step back for reflection on long-term trends, challenges and opportunities—illuminating a path forward for the sector. The 2018 publication takes stock of the industry across six axes: market fundamentals, sales, the competitive landscape, finance, the enabling environment, and impact. It provides in-depth analysis on current market dynamics, projections for the coming five years, and a blueprint for how actors in this market can compete in a swiftly evolving industry ecosystem. The report will be officially launched at the 2018 Global Off-Grid Solar Forum and Expo this week in Hong Kong. Held for the first time in East Asia, the event will convene over 500 industry stakeholders including manufacturers, distributors, investors, entrepreneurs, donors, and policymakers. The event will also be an opportunity for companies to showcase their latest products, services, and innovations at the industry’s leading exhibition. GOGLA is the voice of the oﬀ-grid solar lighting and electrification sector. Established in 2012, GOGLA now represents over 100 members as a neutral, independent, not-for-profit industry association. Its mission is to help its members build sustainable markets, delivering quality, aﬀordable products and services to as many households, businesses and communities as possible across the developing world. The products and solutions that GOGLA members sell transform lives. They improve health and education, create jobs and income opportunities and help consumers save money. To find out more, go to www.gogla.org. Lighting Global is the World Bank Group’s platform to support sustainable growth of the international oﬀ-grid solar market as a means of rapidly increasing energy access to people without grid electricity. Through Lighting Global, the International Finance Corporation (IFC) and the World Bank work with GOGLA, manufacturers, distributors, and other development partners to develop the modern oﬀ-grid energy market. The Lighting Global program — in partnership with industry — provides market insights, steers development of quality assurance frameworks for modern, oﬀ-grid lighting devices and systems, and promotes sustainability. To find out more, go to www.lightingglobal.org. ESMAP is a partnership between the World Bank Group and 17 partners to help low and middle-income countries reduce poverty and boost growth, through environmentally sustainable energy solutions. Situated within the World Bank, ESMAP inﬂuences billions in loans for development projects, leverages public and private financing, and shapes global policy. To find out more, go to www.esmap.org. Dalberg Advisors is a strategic advisory firm combining the best of private sector strategy skills and rigorous analytical capabilities with deep knowledge and networks across emerging and frontier markets. It has a dedicated Energy practice to help clients – from governments to multinationals and financial institutions – increase the supply of economically viable, environmentally sustainable, socially equitable energy. Its expertise spans designing evidence-based strategies for entering emerging markets, developing business models for doing business with low-income consumers, policy analysis, and innovative financing to find energy delivery models. To find out more, go to www.dalberg.com.